For months, SDOT watchers have been agonizing over the fate of One Center City’s program of bus and bike lanes, as well as the Center City Connector streetcar and its dedicated lanes. 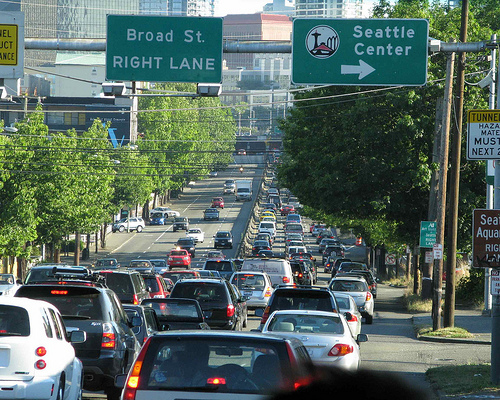 Mayor Durkan’s new proposal to toll the city center makes these petty squabbles by comparison. Obviously, there’s a lot of process before anyone pays a toll. But if, somehow, the proposal survives and sets tolls as high as necessary to avoid congestion, that implies open streets downtown. That is way better for transit than fighting block-by-block for bus and BAT lanes. The big exception here is bikes: backpedaling on ambitious bike lane plans plus faster traffic flow actually makes the status quo worse for the two-wheeled. That’s all the more reason to switch the emphasis of One Center City from bus lanes to bike safety. However, in a bad sign for anything happening at all, on Sunday Danny Westneat started off the equity backlash, though he at least proposed constructive alternatives like allowing specific cars only on certain days. Ultimately, there’s a finite amount of road space and we will ration it somehow. Today, it’s by willingness to put up with traffic delays, and tough luck if you need to get there fast. Congestion charges sort by a combination of wealth and the value of someones’s time, and tough luck if you put a very low value on your time. A rotation scheme is equitable except for those with access to multiple cars, a perverse incentive if ever there was one. But the main cost is that there are days where you can’t drive downtown at all at any price in time and money. Personally, I’m simply not moved by the equity argument. The downtown core is well-served by transit from nearly everywhere. Driving there is already expensive and difficult, so the extremely price-sensitive take the bus or train. The great mass of working class people that drive to do their jobs are getting paid (or forgoing paid work) to sit in traffic. It is worth it for them — or the people that pay them — to give them clear streets to be more productive. And finally, congestion pricing is revenue-positive, providing space to compensate the handful of disadvantaged people hurt by such a system (also, congestion may cost Metro $100m annually, even more money that could be plowed into increased service). Technical merit is never a guarantee that a project will deploy, but if it does Mayor Durkan will have a transformative transportation legacy in downtown. Martin: I think we should be deeply skeptical of the congestion pricing plan and announcement timing. This announcement comes on the heels of deferment of the CCC, the basic bike network, and now it sounds like Move Seattle will be gutted as well. The stated plan, to implement congestion pricing in an election year, has virtually zero credibility when the city won’t even enforce bus lanes. I think it’s great the are doing a study. But that’s really all we can expect to happen for quite a long time. Meanwhile, real plans that we’ve fought for *for years* and supported in votes are going down in flames. Martin clearly pointed out why the bike plan should go forward. On that we all agree. As far as most of the other issues you mentioned, the problem is money. The CCC was deferred because it is a lot more expensive to build and operate than previously stated. There were questionable assumptions made by the previous administration; everything from ridership estimates to the cost of operations. The latter was the result of poor communication between SDOT and Metro. Given the well reported communication failures on other projects (e. g. the Northgate Pedestrian Bridge) it makes sense for the new mayor to ask for an audit. It is quite possible SDOT was a poorly run, isolated agency that fudged the numbers frequently. We could ask the head of SDOT about this, but like a failed CEO, he has moved on. Oh, and no one actually voted for the streetcar. If there was a vote, it would have probably lost (since the streetcar is an obviously flawed concept). Move Seattle projects may be gutted simply because of federal funding. That applies to every aspect of the project (bridges, sidewalks, etc.). Unfortunately, that is simply the nature of projects all across the country. Finally, tolling is different than bus lane enforcement because it can be done with machines. That doesn’t mean it will necessarily be cost effective. It is one thing to put up the automated tolling booths in a couple spots on SR 520, it is quite another to put them on dozens of streets downtown. But that is why you study those things, to see if it makes sense. I agree it’s a longshot, and I don’t see anything in this post that would suggest Martin is overly naive about how difficult this will be. But I think it’s worth resisting the idea that this is some sort of political “distraction” ploy. Pre-implementation congestion pricing is likely to be wildly unpopular with everyone but nerds like us. You don’t distract the public from potentially unpopular decisions with promises to do something that will surely be far more unpopular. Nerdy wonkish urbanists who understand this is a good idea aren’t some huge constitutency she needs to find a way to placate. What does Kyle mean by Move Seattle being gutted? Move Seattle is “gutted” because the city can’t spend money it doesn’t have. The plan assumed a level of federal funding that may, in retrospect, be too high. So the Durkan administration is doing the sensible thing and looking at what their priorities are. Do they stay with the original plan, just more slowly? Do they reconfigure to recognize that the most federal-dependent projects are now relatively more expensive than the less federal-dependent projects? Do they postpone fed-dependent projects to the next administration when that funding might be more freely available? Anyway, this is common sense management. It reflects no discredit on the city or the Mayor that they are looking at this. It does, I think, raise the question why this wasn’t highlighted in 2017 by the previous administrations. The threats to federal support didn’t begin in 2018, and have arguably eased in recent months. I assume he’s referring to the delivery of fewer RapidRide (Plus?) lines than were sold in the package. At this point, I’m honestly unsure of what RapidRide lines are going to be added, aside from Madison. Of course, Move Seattle had most of its money on maintenance and sidewalk building and those are still in play. The single largest project funded by the Levy is the Lander Street bridge, which removes sidewalks on one side of the street and does not provide a signal or marked crosswalk at the nearest intersection for people to get across 4-5 lanes of traffic. It has already gone to bid. Keith, Seattle City Council is a directly elected Board. Meaning that some intensive citizen activism on a specific measure, needing very little civil engineering to implement, could solve transit’s most urgent need inside Seattle city limits. Those reserved lanes. How many car-loads can one transit lane move? With enough buses and speed- aren’t some signals already designed for pre-empt?- can be better experience than a trapped car, especially on the way to LINK or express buses. Compared to any other measure, budget-wise almost cheap. Extra policing less expensive than unnecessary infrastructure. Regulations not very complicated. And instant highly visible reward on very short notice. With strong short-nice campaign measure: a real-time comparative demonstration. Announced in advance, at rush hour, leave all lanes driveable one week, and one reserved lane per direction the next. Where signals won’t pre-empt, have police keep order by hand. Any of these signals have manual emergency switches on-site? Picture worth a thousand…. And then, instead of considering opposition forces as single entity, find out exactly who the opposition is, and both gain intelligence and start to exert pressure accordingly. Not only on them, but also their elected reps, more specifically the better. Also their customers. Worth- and I agree on their worthlessness- a coal-car train full of studies and flip charts. So if pro-transit forces concentrate max efforts on this one point, at least their targets will have fewer excuses for not paying attention. But some badly-needed stress-relieving proportion and perspective: 2024-2018 is six years. Which, used to maximum advantage, could put us at many more decades ahead. This year, results of next seven months’ effort could bring two years’ chance to make sure we still have a country, though badly in need of employment generating repair in 2024. With new voters finally in the mood to replace people, transit-lane campaign good example of something political that can cut some young, sharp political teeth. I generally support tolling but congestion pricing just seems like a terrible idea at this time. I love you Seattle but you’re not London – not yet. What threshold does “London” represent that Seattle doesn’t meet, and why is that the relevant threshold? Milan and Stockholm aren’t London, either –was congestion pricing a mistake there, too? Why? That it could save Metro 100M in operating costs is, if accurate, plenty good enough for me, especially considering how much saved time for riders that represents. Where am I going wrong in my thinking? London was able to rapidly deploy bus service improvements and service hours after congestion pricing was implemented to provide viable alternatives to car commuting. Today KC Metro and friends have issues finding enough bus drivers to run existing service. Where are they supposed to find more bus drivers willing to stomach a lower-pay probation period in such a hot labor market? Congestion pricing makes sense in 2024 when Link has four-car trains running every four minutes between Lynwood, Federal Way and Redmond. But not today, when all the buses and Link and park and rides are full and there are clear obstacles to improving any of those capacities. According to Tom Tom Traffic index and Inrix Globe traffic score card London’s Traffic is still worse than Seattle traffic. @Ian, traffic =/= capacity. The people you price out of driving downtown will have to get there by some other means, but all the other means are full. @Andrew, East Link is under construction as we speak, Lynwood Link is about to start and Federal Way is not far behind, so what are you talking about? @Henry: Andrew is saying that if we start work on the congestion tolling system now, it will come online in 2024, just in time for Link to be up and running with increased capacity and coverage. Gothenburg worth a visit for everybody slightest bit interested in city planning and surface transit- meaning streetcars, buses, automobiles, biking, and walking. My favorite: Icelandair to Reykjavik to Copenhagen, platform by escalator, couple of hours north by train. Didn’t read the law on anti- congestion measures. But nobody puts a”Jay” in front of the “Walking. Very few warning signs. And enough streetcars, buses, bicycles and shoes you that can barely get a car into the “CBD”. Also have to point out , though,that southern Sweden, roomy and flat or rolling, is starting to develop dread plague symptoms. Malls and traffic jams. And gruesome Norse horror story: TV lounge of hostel, Vadstena central Sweden. TV announcer celebrating opening of first new McDonald’s. But personal Says-it-all incident: Not my idea, honest. Maybe diplomatic honor, maybe just to teach me my place, but after short tour of Vastraffik shops with their Chief Instructor, find myself at 11am in extreme front seat a 90′ LRV (“It’s a Breda, they’re not very good, but they got the low bid!”) gliding across a pedestrian island in the middle of a lake of walkers. Standout in the crowd: On my left, a young woman pushing a baby carriage at a pretty good “clip”, looking at the plaza pavement. Instructor pushes my hand forward on the controller. “We always do this, no exceptions, everybody expects it. Just tap the bell.” Carriage-driver doesn’t look up, just slacks her pace a little. Not even close. Though I had more hair, and without a gray strand, when I took the controller ten minutes before. Heard somewhere that babies can identify voices and music before we’re born. Beside bells like small cathedrals, streetcars unmistakably vibrate (understatement) pavement too. Major advantage of street rail over bus. So after I’d say two generations, we’ll have a lot more than one CCC, and a lot less demand for cars in Pike Place Market. BTW, absolutely NOT kidding. One of Franklin Roosevelt’s most popular and effective Depression relief programs was the Civilian Conservation Corps. Always called CCC. Basically, civil service jobs building very things that are falling same degree apart right now. Nobody could call it “make work”, except average foreman did that. If we can’t get transit into the Defense Budget, this’ll be a lot easier and better. I dislike Congestion Pricing for two reasons. One, it’s “Egalitarian Regressive”. Income-irrelevant. Meaning rewarded. Suspiciously like what happens for a second wrong-order LINK tap sequence. And even more resemblance: same air of sanctimoniously satisfied punishment on part of supporters. Much better approach. For what used to be the Downtown Ride-Free area. shoes, bikes, jogging-strollers, and transit. Only Emergency vehicles no argument, cabs if they have drivers. Transit trolley-wire and battery. Brass posts across former streets at entrances. Outside this area, continue current car/transit discussion. As pointed out, congestion itself is already making transit an ever more Freedom Oriented choice. Also no need to do this all at once. Gothenburg still has plenty of cars. All of which, along with their fuel, licenses, and draconian driver training cost plenty of money. So, Öresundståg headed for Copenhagen, took along this lesson. Of course make the law and politics progressively more pro-transit. But emphasize not forbidding cars, but attracting, encouraging, and protecting ever more people. Quiet heart to heart with the Chamber of Commerce could be different now than a few years ago. Steel-wheeled 5000. Passengers hate them worse than drivers disrespect them. German cities as small as 200,000 have surface light rail with a downtown tunnel. There is no rule that says only cities of 7 million people should have congestion pricing simply because they’re the only ones that have tried it. Just like I made the mistake of thinking that higher density means less expensive housing until i thought about the counterexamples of Dallas and Houston. What matters is not the absolute amount of housing but its relative amount to demand, expressed in the vacancy rate for rentals and the time on the market for sales. When the vacancy rate gets tighter, more people are competing for the same number of units and the price goes up. When the vacancy rate goes up, the price goes down. That’s exactly what happened in Seattle in the 1980s, 2003, 2008, 2002, and 2017. Both Dallas and Chicago have moderate-priced housing even though they have different strategies: Dallas allows unlimited sprawl but limits density, while Chicago allows infill density to rise to meet demand. Seattle and many West Coast cities cap both, which is why housing prices rise when the population increases. Similarly, the question of where congestion charges are appropriate depends not whether the city is the size of New York but how demand is relative to capacity. Cities like Paris put transit/bike/peds absolutely ahead of cars, and routinely convert car lanes to transit lanes, and Paris has even set a shrinking parking quota so it eliminates a few street-parking spaces every year on principle. If Seattle and other American cities did that, it might lead to congestion charges in a lot of cities both larger and smaller. Then we could really see how well they work in different-sized cities, and what the minimum practical size is. Likewise, Europe has pedestrianized shopping streets that are very popular, but when several American cities like Tacoma tried that, they failed (nobody used the street or shopped at the shops), so they ended up putting back two-lane roads (narrower than before, so more pedestrian-friendly). It’s possible that congestion pricing will fail like that in some situations. But the situation in New York is not failure but never tried, because the state keeps blocking it. I’m cautiously optimistic on the overall concept, but the revenue side of the equation is somewhat complex. Will there actually be a lot more revenue? Parking revenue (meters and taxes) will presumably decline if driving drops substantially. Plus, installation and operating costs for a congestion charge system are not zero. Then there is the tricky category of exemptions and discounts. I could see political pressure to exempt or discount various groups for one reason or another. London has several examples of discounts, including within-perimeter residents, electric cars, taxis, and motorcycles. The electric car one is problematic – you can just see the “Tesla owner drives for free while struggling single parent working two jobs must pay” headline coming. But there’s a lot of support for electric cars and Tesla owners also donate lots of money to political campaigns. That is why it needs to be studied. It is quite possible that it wouldn’t make much money, but would save Metro a bunch. I have no idea what discounts would apply, but my guess is very few. I see no reason why they wouldn’t charge every motorist. I doubt the city makes a _ton_ of money on parking given how few spots are left. >> Personally, I’m simply not moved by the equity argument. Me neither. To be clear, there will be people who will be unfairly hurt by this tax. But that is true of every tax that occurs in this state. There is not a single tax in this state that could be considered progressive. Most taxes are regressive, and it is much easier to argue that they are unfair. For example, people who live in remote parts of the county may need their car for work. They need it because using transit is slower than walking,and walking simply takes too long. Yet those people still pay car tab taxes. They still pay for a driver’s license. It isn’t just drivers that pay a tax. The same is true for various jobs. If you want to fish for a living, you need a permit. If you want to be a nurse, you pay for your license. If you want to work as a cosmetologist, you have to pay for a license. These are yearly fees, for some of the lowest paid professions. In all of these cases, there is nothing you can do, but pay the fee. In the case of this tax, it is different. As you said, the downtown core is served well by transit from just about everywhere. You don’t need to have good transit from your door to downtown to find a transit alternative. You can drive to a park and ride, a pay lot, or in many cases, a free parking spot, and then catch a bus or a train. Having a fee to drive downtown is a reasonable and sensible way to both reduce congestion as well as fund better transit. It is probably the fairest, best funding mechanism available to us. Yeah, “we shouldn’t do X (where X is a tax or regulation) because some poor/disadvantaged/otherwise sympathetic person might be burdened by it” is generally just a way of making your anti-tax/regulation position seem progressive, when it’s anything but. A hell of a lot more poor people ride the buses that get stuck in traffic. They count too. I’m also not convinced by this argument and I hope that advocacy groups can see the potential for huge benefit to low-income people by designing a potential toll equitably. This could be seen as a very progressive measure that taxes wealthy SOV drivers to invest in infrastructure that benefits many more people. I would hate to see the Seattle Times types and the advocacy types align against congestion pricing on the grounds of equity. It would be relatively easy to provide a discount to low-income households. If Metro, school districts, affordable housing, healthcare etc, can do it, I don’t see why SDOT, WSDOT, etc. could not do it. There are many existing verification programs and many share eligibility requirements. This approach would recognize that with the suburbanization of poverty and our current transit network, there are some trips that are really best made by car. Over time, as we are able to invest more in the transit system, we hope there will be fewer such trips. I don’t get the equity argument, either. If we are imposing taxes or fees on something to prevent or reduce the behavior, why do we want to make the deterrent effect smaller on poorer people? Should there be a subsidy on cigarette taxes based on income level? Operating and parking car already costs a lot of money. Jarrett Walker over at Human Transit says that we should call it a decongestion charge. We want to make the streets flow more easily for transit and everyone who is forced to drive, so a decongestion charge should ensure that only higher value trips are taken. Others will choose to use transit or not to come. Both help decongest the core. A congestion charge is a fine way to try to do this. I think Westneat’s idea is kind of nutty – since often people who come by transit or park pay a monthly plan fee. And it really doesn’t solve the problem when you have a doctor’s appointment or court date or whatever. Right, but none of those involve driving to downtown Seattle. Again, by all means, drive to a convenient bus stop. But driving downtown is simply unnecessary, and for most people, already a luxury (because parking is expensive). For everyone that argues that we shouldn’t consider congestion pricing on equity grounds, the transit community should counter argue that bus fare is also inequitable. Let’s abolish bus fares and fully fund the service through higher property, capital gains, and (if the courts eventually rule in favor of it) income taxes. That would be wildly more equitable than our current system, where we charge our poorest residents, those who can’t afford a car, some of the highest bus fares in the nation. When your position is against any change, its very easy to stall, criticize, and delay. It’s too bad Danny Westneat is making such a clearly flawed argument just to keep the status quo. I was just starting to like him after his “ban cars in SLU” piece. Oh well. NO! The point is not to “bleed the rich”, the point is to remove cars from the streets of downtown Seattle. Poor peoples’ cars take just as much room as rich peoples’ cars. And, not to put too fine a point on it, but what are poor people doing driving to downtown Seattle for work anyway? If they’re employed but poor ipso facto they don’t command much compensation for what they do. Essentially, a low paying position is a job that many people can do reasonably well so the potential pool of workers is functionally unlimited. For service workers it can make sense to brave the downtown congestion for the larger tips, but they probably can’t afford to park anyway. This “equity” thing is a flaming straw-man waved about by fundamentalist autoistas in order to maintain the upper hand against bikes, pedestrians and transit users. While I’m strongly supportive of decongestion pricing, having a flat fee for everyone regardless of income level* is extremely regressive. If you charge a flat $5/day fee, higher-income people won’t even notice, but to low-income people this could mean the difference between being able to pay bills or not. So the deterrent effect is not even the same for low-income vs. higher-income people. At a minimum, there needs to be a substantial discount for lower-income people who absolutely need to drive into Seattle. (For those who don’t, the reduced fee + parking + the cost of car ownership is enough of a deterrent). The income verification system is already be set up for ORCA LIFT, so it shouldn’t be difficult. *It should be noted that people with high-paying jobs (such as at tech companies) often pay LESS for transportation than low-income people, since they often receive free transit passes or parking subsidies from their employer. This is a broader problem but it’s unacceptable that low-income people are forced to pay a much higher *amount* (not even percentage) for transportation than more affluent people. One might address the equity issue somewhat by lowering other taxes (say, land, business, sales…) and making the congestion charge reform revenue neutral. If this is not done, one does actually two things: a) introduces congestion charge, and b) increases taxes. I am not saying that it is necessarily a bad idea to hike taxes, just that it’s a different question. Obviously, the feasibility of revenue neutrality depends on what are the costs/revenues of the congestion charging. If the costs are large, it will eat up most of the revenues and in some sense we have a wasted tax (it will still address the congestion though). There was a recent story about congestion pricing in New York City being rejected by legislature under ridiculous equity arguments about how unfair it would be to make poor people pay more to drive their cars into Manhattan. If people can’t even agree on the need for congestion pricing there, getting people to do so here seems almost hopeless. Another thing that came out of the New York leglisature’s decision was that the extra fee for Uber and Lyft rides would remain, even while everyone else gets to drive on the streets for free. This is effectively saying that people driving their own cars have greater entitlement to the street than people paying for others to drive them – even enough, in the middle of Manhattan, people driving their own cars are substantially wealthier, due to the cost of parking. I’m ok with taxes on Uber and Lyft for use of the street, so long as people who drive their own cars have to pay them to. Otherwise, you’re just writing a tax policy that encourages individual car ownership, which ultimately leads to more driving and more traffic – drive your own car, the city allows you to use its streets for free – pay somebody else to drive you, now, that same street space, you have to pay for. I can definitely see why proposals like this are tempting. The logistics of revenue collection is easier (no toll equipment), and also, Uber and Lyft make a convenient scapegoat for downtown traffic problems (since people generally don’t consider them deserving of the same level of entitlement to the streets. The skeptic in me feels like the congestion pricing thing is “bright shiny object for activists” and the spoonful of sugar for the medicine of disinvestment in bikes and transit to go down. If so it’s kinda brilliant…endear yourself to the activist crowd by putting something forward you know won’t happen for years at best, while splitting the activist community on perceived equity grounds, while making every possible poor decision in the present. If this cynical calculus is true, Martin’s headline shows that it’s working. Again, I think this radically overstates the popularity of pre-implementation congestion pricing. Wonky urbanist nerds are not a significant voting block. If the medicine is actually more popular than the sugar (and I’d wager it is, in this case) your theory doesn’t really work. I realize that it’s a minority view here, but I think that SDOT should just wait on big transportation changes including bicycle safety projects until the new 99 tunnel opens later this year. Profound changes in travel behavior and traffic flows are coming! I have some sympathy with that argument, but the answer is it won’t make much difference to overall mobility, and it will increase traffic on diwntiwb streets. There’s no way it will lead to a wholesale shift to 99 because 99 doesn’t go to many places. The expressway ends at N 73rd Street and there’s an inconvenient gap between there and I-5. Only a few people are going to 130yh & Aurora or will take 99 from die town to Shoreline or Snohomish County, and those in Lake City also won’t be taking it. Going south o9 us good for West Seattle, South Park, and the airport but most everything else is east if it. There’s no way it will decrease traffic on downtown streets because those who currently use the downtown or Interbay exits will have to switch to surface streets, and me those whi6 object to tolls will do so so. So the city is right that traffic will increase. It just may not be exactly right on which streets, how much, and how much if the day. So it can maybe postpone construction but it should b’s postpone planning and preconstruction, so that it will be ready to jump on it with shovel-ready projects when the need is clear. I would add that the profound changes I expect will happen deal with the way vehicles move around Downtown and not how much traffic will decrease. With the loss of Downtown ramps to and from 99, those drivers that used those ramps will go elsewhere. The changes will mean that some intersections will get more traffic or turning traffic, and some will get less. New traffic bottlenecks will appear or get worse, while others may go away. It’s going to be a new, permanent change — and it’s silly to spend public money pouring concrete or signing and striping changes when there could be the need to change things again in just a few more months. We should just be patient! Yeah, I agree with Mike. There is no reason to wait, because we know that the changes to SR 99 will make traffic flows to downtown worse. The combination of tolling SR 99 along with the lack of ramps is a double whammy. Folks who are cheap will avoid the tunnel, while folks who used to use the tunnel will find it hard to get to. There is only so much that can be done about the latter group, but this addresses the former. In some ways this also addresses the second group. If you are in Ballard and want to get to West Seattle right now, the obvious route is down 15th to Western, onto the VIaduct, and onto the West Seattle bridge. When the viaduct goes away, you have a couple options, cut over to I-5 or cut over to Aurora. But cutting over to Aurora isn’t nearly as easy as just going down 15th. It is even worse for folks in Magnolia or West Queen Anne, as they would cut over farther south. For many, cutting over to Aurora involves Mercer, and if you are on Mercer, you might as well use I-5, especially if it is cheaper. At the same time, simply following Elliot to Alaskan Way is not a crazy idea. There are more lights, and some traffic, but it is a much shorter distance. There has been extensive work done along the waterfront to enable vehicles to travel there, making it quite reasonable to charge a fee for the use of that roadway. That might discourage some folks from driving that way (which is the point) or at the very least, get those people to chip in for the projects that could help improve transportation in this town (the other point). From much of Magnolia it can be faster to take Nickerson rather than battle the mess on 15th. While a number of people will probably not think to do that, there will probably be some. The mess at the north end of Queen Anne getting on and off 99 could get interesting. Wouldn’t it be easier and less controversial to increase the parking tax instead of tolls. This seems like it would have the same effect of charging to drive downtown while not introducing an additional collection point. The problem is that such a tax has no effect on Ubers and Lyfts, which don’t need to park. Nor does it have any effect on those who will simply drive through downtown, avoiding the tolls on SR 99, and the hassle of getting onto I-5. There are also people who drop off people downtown (and don’t charge for it). Those people will have to pay a fee or drop them off near a bus/train stop. This is my thought. People who are parking downtown are going to downtown specifically from outside the city core. These are the people that in all likelihood have viable transit options from their home to downtown. So increase the tax/rates of parking inside the downtown core will be far more targeted at people who have the real option to use a bus to get to work. Unlike a downtown entry fee that will tax everyone including people who are just travel through downtown because it is between their home and their work. In which case they likely have far worse options for using transit to get to work. The Basic Bike Network and the permanent 24/7 transit lanes (neither of which are happening) would be the most effective solution to the equity argument. Martin is right that allowing traffic to be faster but not providing protection for bikers is the real equity problem, which isn’t just about the wallet of one entitled writer’s notion of fairness, but about the safety of the people being treated unfairly. I am getting sick of this argument from the anti-transit/bike advocates that somehow it’s the poor blue collar worker that’s driving alone to his job downtown and that it’s the rich,privileged tech workers braving the elements on a bike or stuffing themselves on crowded buses and forgoing the comfort of a car. It’s beyond backwards. I am sympathetic to the delivery driver or construction worker that does truly have to drive downtown–find a way to make an exception/reimbursement for them but don’t forgo the mobility of an entire city. A dirty little secret is that many office buildings with parking garages negotiate parking spaces in with rental agreements — and many times those spaces go to the most senior executives of the commercial renters at a reduced cost or for free! Seattle hasn’t seemed to study this in depth so it’s hard to quantify what the percentage of Downtown traffic is actually to/from free parking garages there. It is an interesting aspect of congestion pricing on how it impacts this “executive free/subsidized parking”. Working-class people who must drive to work because there’s no reasonable transit option are going to outlying worksites, not downtown. We need to address the two situations separately because they’re opposite. The city doesn’t always do a good job of this because while it rightly toots that the number of downtown workers who drive to work has gone down to 30%, and last decade’s job increase did not increase the number of cars, the situation is completely the opposite for jobs outside downtown. The number of workers in Rainier Valley, Ballard, Wallingford, Kent and elsewhere who drive to work is probably still above 70% and is not going down that much. a) Civil Liberties: I am real concerned anytime the government wants more of our data – especially around our mobility. Just as few of us STB commentators trust the Trump Administration with being fair, I sure don’t want them or any other government having one more byte of data about our lives. Did we or did we not learn in 2016 that political campaigns can just request reams of data about us from Sound Transit, and we citizens have little recourse? Who’s next? b) Leaks to Corporations: I can just see this data being used by insurance agencies to jack up auto insurance rates. It’s just not something we need. c) New tax: Why this need for new revenue? Or will another tax somewhere else be lowered? Listen, I get the intent of this. It’s rather noble. We need to pay for our roads. We also need funding to pay for more buses as the Sound Transit buses I ride running now in/out of downtown are standing room only. So here’s what I suggest: Do 100% away with “free” parking of cars anywhere in Seattle Downtown. There. Charge for parking = charge for congestion to park + no spying. How do you implement this for privately-owned garages? I disagree with the statements that “The downtown core is well-served by transit from nearly everywhere” and “driving [downtown] is already expensive and difficult”. Outside of Seattle’s city limits, bus service rapidly becomes hard to use. For example, going from my house in Kirkland to Uptown requires a mile walk and at least 2 transfers for the 2 hour trip on a good day (plus the inevitable waiting due to misaligned busses), but the drive is usually less than an hour on most days (via I-405 and I-90 HOV lanes). Not to mention that, compared to driving, the busses in this region are prohibitively expensive, resulting in a $3/day drive (@19 MPG) becoming a $7/day bus ride (that cuts down to $5/day if you get a bus pass and commute round-trip to work at least 20 times a month. Frankly, I wouldn’t even consider the bus if my employer didn’t offer a free bus pass, and I also have to admit my wife gets free parking at her work. However, charging a toll downtown would probably force me to find a new employer outside of the city before I would consider the bus. I don’t think most people have the extra time or money needed to use the bus. However, if they lowered the buses to $1.50 or less each way, then at least it would cost about the same as driving, and I bet more people would take the bus because it would save them money (even if it takes a lot more time). So drive to where the buses are more frequent. If you can drive downtown, you can drive to where the buses are. That’s the whole point of this. Driving becomes more expensive than taking the bus. So you take the bus. >> However, charging a toll downtown would probably force me to find a new employer outside of the city before I would consider the bus. Seriously? You would quit your job and commute somewhere else entirely, just so you can avoid five bucks a day? Does that mean you would keep your job if your employer gave you a raise of less than 75 cents an hour? Oh, how much do you pay for parking downtown? In what weird world is it actually cheaper to drive downtown and park versus taking the bus? How many employers provide free parking, but don’t provide free bus passes? Very few, I’m sure. No one is arguing that taking transit is faster. Just like getting a limo ride is faster. Just like driving in the HOT lanes is faster, or taking a helicopter. What folks are saying is that there are reasonable alternatives that are used by lots of people, and that if you want the premium service, then you should pay more for it, because it slows down the majority of folks who are OK with transit. Your other arguments are right – but “drive where the buses are” doesn’t work when almost all the Eastside park and rides with frequent service are full to bursting. If the park and ride is full, park on the street or pay for parking. You might have to walk a few blocks, but it shouldn’t be too hard. You adjust; you learn which lots are full and which aren’t, just as folks adjusted to driving downtown. And bus connector service to those suburban park and rides is minimal to none. I can’t get to the park and ride before about 6:45 because our daycare doesn’t open until 6:30AM. So, the park and rides in my area are full long before I could get there. Speaking of daycare, I need to be at work from 8AM-5PM; when you add 1.5 hours each way to drive/bus from daycare, then I am 2 hours over the 10 hour legal limit for keeping my child in daycare. Plus, there is not enough time for me to get from daycare to work without being late if I take the bus. I think that creating more regressive policies like expecting people in an expensive region to pay even more money to live there are a bad idea. If someone is driving because it’s the cheapest option, then I don’t think increasing their hardship by a couple more dollars a day is a good idea. Sure, anything that reduces the value of my paycheck at my current employer will make me consider working in a different place. It’s not like switching jobs is a big deal; in fact, for those born after 1980, changing jobs every couple years is just a part of life and the fastest way to get a raise. Not to mention, $0.75 per hour ($1,560/year) is enough for me to consider a different employer. Heck, that’s a round trip ticket to most places in the world, and could mean the difference between a vacation in the US or one in Europe/Asia/Australia! It’s obviously not reasonable to compare carpooling to work with renting a limo or flying in a helicopter; I admit I would love a 10 minute commute, but the $1000+ price tag makes that impossible for me at this time. However, deciding if you spend 1.5 or 4 hours commuting every day is the difference between living a happy life outside of work, and spending the week wishing for the weekend. I don’t know about you, but I don’t especially like commuting enough to willingly spend an extra 15+ hours a week doing it; in fact, that additional commute time alone would make me look for a new employer. Especially when you would need to pay more money to spend more time commuting. I mean, you are talking about spending over 1,000 hours a year on a bus rather than around 400 hours in a car. I mean, it’s easier said than done, but we need to decrease the cost of transit. If it were comparable to the cost of driving, more people would do it, and maybe commute times would decrease enough for things to balance out better. I don’t think the issue is that only some people are OK with commuting, I think the issue is that commuting just isn’t affordable enough or fast enough to be an option for most people to consider it. Driving may take under an hour now, but if there isn’t any tolling and everyone clogs the surface streets then how long does it become? From most locations in Kirkland to uptown is at least 10 miles, so at least 20 total. The real cost of driving, depending on your vehicle, may not be quite as much as the federal government estimates, but it’s a hell of a lot more than 15 cents a mile (my understanding is that properly calculated the very cheapest-to-drive cars are probably at least 30 cents a mile true cost). You’d have to have a very efficient, low-maintenance car to beat the bus price. Just because the bill doesn’t come due right away doesn’t mean there aren’t costs to driving beyond the gas bill. I didn’t include the cost of the car in estimating my commute because my commute is such a small portion of what I use the car to do; additionally, that cost is also to get 2 people to work and my daughter to daycare (not to mention, the bus is worthless for the daycare part). So, even if I estimated the cost at $0.54 per mile, it would still be cheaper than the bus. My calculation for the cost of commuting does include maintenance (oil, tires, other fluids, and the sum of all repairs I’ve paid) averaged out over the 10 year period I’ve had the car. Real world average cost for gas with my car (120,000 miles over 10 years) is about $0.12 per mile. I’ve tracked every dollar I’ve spent on my car from the day I purchased it. I moved it up to $0.16 per mile to include the small portion of wear and tear that can be attributed to my commute. There is no question that for me, the bus is nearly twice the price of driving, and frankly, I would rather save that extra $600 and 800+ hours a year. The devil will be in the details. CP will be most effective and easy if done on I-5, I-90, and 99. But knowing national/state politics, it’ll end up as a separate toll on every on-ramp and off-ramp where it hits city property. This is not only more complicated and expensive, it would fail to toll pass-through traffic, and therefore miss a large component of freeway traffic. As mentioned in the article, traffic speed may also be an issue. I think that pushes me into not supporting. Great for transit, not so much for walking or biking. The city has no authority to toll on state highways. And tolls are prohibited on Interstates except where they existed before the road was converted to Interstate (in northeastern states) or after a substantial construction project (the 520 bridge replacement and 405 widening). I-5 will have to be rebuilt soon because it’s at its end-of-life, but there’s no room to widen it downtown. There’s a debate whether the I-90 bridge can be tolled because it’s parallel to 520 and suffers from displacement when the latter is tolled, but the City of Seattle has no involvement or control over if or when it might be tolled. Henry, you’re right about the tight labor market if you think that transit driving is the kind of short term temp work for which average industries are competing. But think of your opertioon as a lifetime career of skilled technical work, with millions of dollars in machinery and hundreds of lives in your hands, and you won’t have any trouble finding the ones you need. Whom you’ll interview widely, hire narrowly, train intensely, and supervise intelligently. In our State’s organized labor of the past, many saw worker ownership as our economy’s future. And for years, I worked alongside people who personally handled this order of responsibility in the face of discipline for doing it. And ridden lately with men and women who deserve to a career following their example. Except this time, in an organization that survives by, rather than barely endures, their presence. And these last several years, I’ve seen more than one start-up example, of small companies among most professionally-run technical businesses in the world. President’s office to the machines, everybody employed there who at 18 can run the company for a day if they have to. So the more right you are about next year’s economy, Henry, considering the future we’re being steered into by the talent and character at the controls, the better it might be to have one transit system whose workers are managed right for world’s oldest reason. We do it ourselves. Congestion pricing and use the $$$ to make the non express busses free would be quite “equitable.” And it should be done in a matter of months not years since the “period of most constraint” starts when the viaduct comes down THIS FALL! So which is it: “only poor people ride the bus” or “poor people have to drive into downtown for work?” Hmmm…. If the latter, it’s probably someone making a delivery or providing a service to a customer or business who/which is presumably higher up the economic ladder, given the cost of living or doing business in downtown, so just pass on the cost, it doesn’t even affect the driver. If anything, the driver has an easier time of it because of the decongestion effect. How about this? Bring in fairest Congestion Pricing possible. And also transit-reserve a lane each way for every arterial in the Priced area. Many people in an upper income bracket already prefer transit to driving. The amount of whose fares should make it possible to give poor people a break on fare prices. Also, for every bracket, once again make a pre-paid pass a valuable convenience for passengers of all incomes and transit alike- instead of a fine-trap with a real quick trigger. Easiest way of all to sell fares at all levels. Easy income equity too for penalties too. Either keep $124 the low end, while high end increases proportionally to the defendant’s income. Or, make $123 the high end, and cut proportionally downward. So that since the District Court will refuse to touch it, defendants can either deal with transit about it, or donate the money to their favorite thing about transit. With their name on the donation. Though still have my own favorite income equality method. Start hiring people at decent wages and medical care for everything left either unrepaired for lack of personnel, or left in the yard for lack of drivers. And recoup costs with the taxes paid by the workers, and the investment attracting improvement in public service. Somebody fill me in. What percent of transit’s cost come out of the fare box? Around 30% for Metro. The county has a target window of somewhere between 20% and 35%, and when it reaches the edge the county raises the fare. County Fund Management Policy sets a minimum recovery of 25% and a target of 30%. Sounds like he’s got a spandex suit and a cape. But is he a force for mag-lev, or fifteen lane double deck freeways? Or does Only The Shadow Know? But much more important to public transit: The tiny section on BN down to Portland called “Vader”. Time is obviously tied together at the ends like a dirty cowboy handkerchief. So is Vader all that’s left of the post-Cold-War mutual collapse of both the Old Republic (us) and the Evil Galactic Empire? Or the humble future home of a Bellevue Force-abuser whose cape is still pin-striped on the inside? Because remember what he did to that planet in the first movie. Didn’t the housing market actually do that to thirty years land use planning last week? We really should have stopped with the first movie. Because none of the rest ever had a whole audience of submarine technicians break out yelling when the camera flashed to the weapons-deck of a star-ship. In the only movie theater in Idaho Falls, which is in the desert. Damn. Need another episode to explain that, which really did happen. Like if Vay- por-ware is a really the hero’s father who still looks like he had his radiation suit unzipped when his meth lab blew up.